According to some sources, over 12,000 people are injured in home fires each year—and over 2,000 people die each year in home fires. Fires start from a variety of sources, and a number of them can be caused by using electric heating pads. You may not realize it when you use an electric heating pad for sore muscles—to ease an aching back, neck, or shoulder—that it poses a risk. But it can start a fire if not used properly. What are some causes of heating pad fires? Heating pad fires can be caused by many different things. In general, older models of electric heating pads are much less safe than are newer models and are more likely to result in a house fire. Older models may lack an automatic shutoff, allowing the pad to overheat and start a fire. Older models may lack various temperature settings, remaining on “high” any time they are used. This can start a fire. Older models may just be worn out and cause a short circuit that starts a fire. 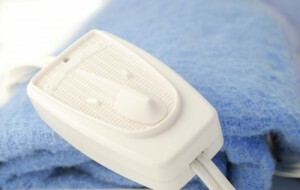 Before using a heating pad, conduct a thorough physical check to be sure it looks trustworthy. If your heating pad exhibits any of these traits, using it could result in a fire. Sparking from the wiring, plug, or outlet. An improperly functioning on/off switch or temperature control. Sometimes consumers are not fully aware of the proper use of heating pads, and fires result. What are some mistakes users make that can result in fires? Be sure to plug the heating pad in properly. Avoid forcing a three-prong plug into a two-prong outlet (or removing the third prong to make it fit). Avoid plugging multiple electrical devices into an extension cord and potentially overloading it. You should never sleep with a heating pad, even if it is equipped with an automatic shutoff. You should not use a heating pad near a water source, such as in the bathroom. Electrocution is a very real risk, and a house fire could also result. You should not use it around flammable objects, including plastic mattress or pillow covers. Elderly people, especially those who are unable to remove the pad if it becomes too hot, should avoid using heating pads. Those who suffer from neuralgia or other conditions that result in numbness or tingling in the extremities may not only receive burns from leaving a heating pad on too long, but may actually end up causing a fire. Heating pads should never be used on small children or infants. A tragic fire could result. Using a heating pad after drinking alcohol or taking medications that cause excessive drowsiness can result in a fire. And remember, when the pad is not in use, it should always be unplugged. Have you had a fire in your home as a result of using an electric heating pad? Please call us today to talk with a personal injury lawyer. You can reach us by email or phone at (720) 420-9800.